Lots of companies talk about the quality of their steel. Our core values haven't changed.. good times with friends and family. Safe, ethical hunters have always been the backbone to our success. Hunters and craftsmen know and trust PUMA’s performance, heritage and technology. The highest grades of stainless steel, innovative designs, genuine stag handles and traditional German craftsmanship are why PUMA knives are considered at the top of every major ranking class hunting and sporting knives. 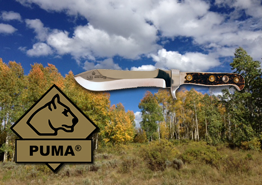 Click here to see the German made knives distributed by the Puma Knife Company USA. If you prefer German Steel over Chinese steel this is the brand you are looking for. 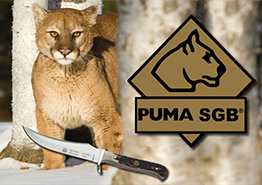 The Puma SGB knives are made of the best materials, including genuine Stag, Micarta, Bone and Delrin handles. All of our Puma SGB knives use Brass Bolsters and pins and are offered with high grade leather or leather trimmed/nylon ballistic cloth sheaths. Click hereto see the wide range of blade designs and high quality knives of hunting, tactical, everyday carry and outdoor/survival knives available on the market today. 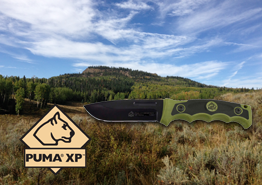 The Puma XP brand was established to produce Knives and Tools that may be too large or have "specific use" that would not be enhanced by using German Steel. An example would be the Puma XP Machetes. These are large tools with a "specific use" like hacking at heavy brush or foliage. To use a high quality 1.4116 cutlery steel would probably not be very prudent, nor a very attractive price point. 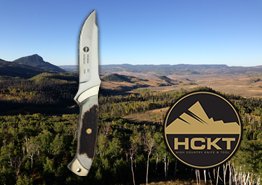 High Country™ Fixed Blade hunting knives offer the best value and function of any hunting knives available on the market today. Compare the features of our knives with others on the market: 440 (5Cr15) Steel blade for extended edge life, genuine Stag handles, Nickel Bolsters, Lanyard Holes and an assortment of blade styles designed with the input from hunters and outdoorsmen. "This knife is well made as are all German products I've owned. Puma is my favorite brand of cutlery. I carried a Puma knife similar to this one for two years in Viet Nam without a problem of rust or deterioration of any kind. Comes razor sharp and will take a fine edge on down the line. A Great Buy for the money!" "I have purchased four (4) Puma Buffalo Hunter fixed blade hunting knives in the last year...If you want to keep it, do not show it to anyone. I have "gifted" three so far, and purchased another one for me. One look at my Puma Knife, and my family must have one. What fathers/grandfathers could refuse?" "Puma hit the mark with this one. Excellent Design, Quality Materials. This blade would make an excellent Survival Knife. Its just thick enough spine, without being too heavy. The knife weighs 11.59 ounces by itself. The Kydex Sheath weighs 6.46 ounces with the included Fire Starter attached to sheath. Blade shape I call a Modified Kukri, slight recurve with weight forward. I recommend this knife 100% for a Survival or bushcraft Full Tang blade with nice Handle. Fire Steel with kydex sheath holster sold me on this knife. All.these features for $60 bucks shipped, its hard to beat this knife and sheath combo." "Great knives....I own 3 of them and have given them as gifts as well. Since I bought the first one....you have won me from Case."